Ever since it was established in the wake of World War II, the UN has asserted itself as one of the pillars of postwar world governance. It could even be said that at the institutional level, the United Nations constitutes the pillar of world governance: no other international organization comes anywhere near it in terms of size, legitimacy, and ambitions. 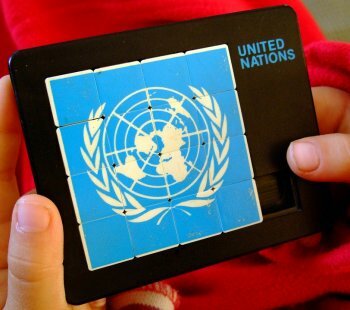 Today, more than 60 years after it was set up, now that the long Cold War period is starting to become a distant memory and there is dire need to design a new geopolitical architecture, what role can the UN play? This question, both simple and complex, is at the core of debates on new world governance recurrently. In this short essay, we shall try to offer elements of an answer to it. Our critique of the UN will necessarily include a measure of subjectivity, all the more so that the subject implies that we make a number of assumptions on the future, which, as we all know, remains to be written. In fact, the aim of this discussion paper is not so much to provide a definitive solution to the UN issue as to trigger a debate that we hope will be fruitful. This essay comes with a file put together by Stéphanie Ah Tchou in the form of info sheets and interviews on specific UN-related subjects including its modus operandi and its financing. The info sheets are intended to give readers quick access to information and thinking on the United Nations and to provide links for them to deepen their knowledge (in French only for the moment) if they wish to do so.